Three years and an HGH-related suspension ago, Rashard Lewis was a major contributor for an Orlando Magic team that fell just short of winning the 2009 NBA title, losing to the Los Angeles Lakers 4-1 in the Finals. That season, Lewis shot 39.7-percent from the 3-point line, 43.9-percent from the field and averaged 17.7 points per game. Big forwards didn’t want to run out to the arc to guard him, and he would post small forwards up for easy baskets. He was a nightmare to guard, and, mind you, a 2009 All-Star. The Magic exploited the Lewis-Dwight Howard combination perfectly. But then the decline began. Fast-forward to the conclusion of the 2011-2012 NBA season. 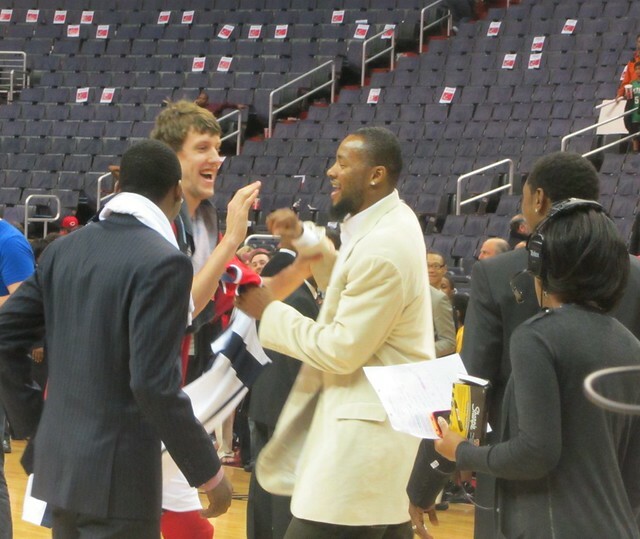 Rashard Lewis was immaculately dressed in an over-sized suit on the end of the Washington Wizards bench next to Maurice Evans or whatever D-League player deemed ready for at least 10 days of prime time. 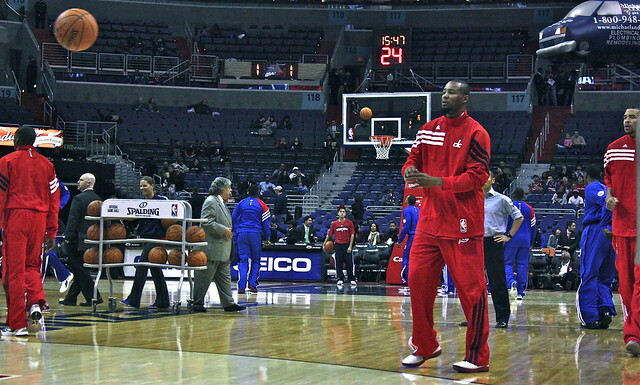 Lewis appeared in 28 of the Wizards’ 66 games. He shot 23.9-percent from the 3-point line, 38.5-percent from the field, and averaged just 7.8 points in 26 minutes per game. He started 15 games, but his averages (8.6 points, 25-percent on 3-pointers and 39-percent from the field in 29.0 minutes) were just as putrid as his bench production (6.8 points per game, 21-percent on 3-pointers and 37-percent field goals). Even before a bone bruise to his perpetually plagued knees officially shut down his season, Lewis looked forlorn, sad, disengaged and a shell of the player he was in Orlando. When playing, the few times he got the ball in the post, he could never get comfortable enough to get the desired shot. And the numerous times he was left open — whether it was behind the arc, or for simple a mid-range jumper — he would miss and miss again. Lewis for the most part managed to escape the boo birds that rained down on Andray Blatche, but he could not escape the frequent juxtapositions of his hefty contract and his empty production. The irony of that quote is that there were two instances when Lewis actually did a bit of complaining. After the Wizards were blown out by the Orlando Magic, Lewis, along with John Wall, complained that some of his teammates were playing selfishly, and that they only seemed concerned with padding their stats. Just a few days later, an alleged spat between Lewis and Wizards assistant coach Sam Cassell before the January 8 Minnesota Timberwolves game occurred. Both Lewis and Flip Saunders denied the story, but there was no skirting the questionable nature of a sore knee suddenly causing him to miss the eighth game of the season. The reality is that Lewis looked like a washed-up player whose best days are long gone rather than an impossible matchup. 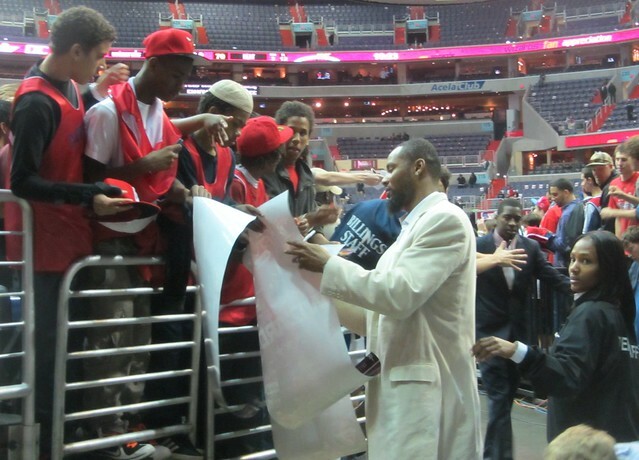 Lewis was not brought to Washington for his basketball prowess, but more as a way for the franchise to transition from the Agent Zero days to the Game Changer; the Wizards also saved some money and a year of cap space in the process. Whatever Lewis delivered on the court would be a bonus, it was thought. But, his injury-laden, diminishing skill set unfortunately made him a liability in a Wizards uniform. Lewis logged just 60 of 148 possible games over the past two seasons and his awkward looking, but deadly long-range shooting touch was a distant memory. When the amnesty clause was created in order for teams to erase contract mistakes off their books, sports pundits immediately pointed to the insane terms of Lewis’ deal. And for good reason, as only Kobe Bryant was paid more to play professional basketball in 2011-12. Washington chose, prudently in my opinion, to avoid using the amnesty on Lewis last summer (to Lewis’ own surprise) because they would have had to add heavy salary in order to reach the league salary floor. Doing so would have jeopardized long-term cap flexibility the team worked so hard to achieve. Lewis is scheduled to make $22.7 million next season with a buy out of $13.7 million. The Washington Post’s Michael Lee recently reported that the Wizards are interested in possibly moving Lewis since his expiring contract could be attractive to a club looking to shed salary. There is no downside for Wiz brass to explore this avenue, but it is a far-fetched scenario and the obvious roster decision will be for the Wizards to cut ties by exercising Lewis’ buyout. If Lewis could still knock down shots effectively, he might be an asset for a squad wiling to take a flyer on the proven vet. But his abysmal 22-percent from 3-point land this season and creaky knees are evidence that the two-time All-Star is near the end of the road. But when you think about it, he’s had a pretty illustrious 14-year career that began in Bill Clinton’s presidential administration. As depressing as this season may have been for Lewis, a change of scenery — and more importantly, an exit out of Washington — seems to loom large. While nothing has been confirmed, Ernie Grunfeld will probably buy out Lewis’ contract for $13.7 million dollars by the June 30 deadline, use the amnesty provision (ironically the Magic, Lewis’ former team, did the same to Gilbert Arenas, former Wizard), or perhaps, as part of a salary cap maneuvering deal, trade him to a veteran team that’s willing to take a low-risk in search of a high reward (much like how the Boston Celtics gambled on Jermaine O’Neal two seasons ago). There is a small chance the Wizards could retain him for one more year, but that seems to fly in the face of the Wizards youth movement that was in place after the departures of Flip Saunders, JaVale McGee, Nick Young and Andray Blatche. Sadly, the most likely scenario for Lewis is that, after being freed from Washington, he’ll sign with a team as an afterthought, becoming the second or third man off bench like Tracy McGrady in Atlanta. From a financial standpoint, Lewis will still get paid handsomely next season, but his next contract, likely the veteran’s minimum of $1.2 million a year, will be a far cry from getting paid in upwards of $20 million a year to play basketball. But the expectations placed on him will be little to none, which may free Lewis up to be a bit closer to the player he was in Orlando. Ultimately his health, his attitude, his team atmosphere, and his shooting percentage will determine how he fares next season, wherever that may be. What more can be said about Rashard Lewis? Seriously. Does anything need to be said? Can anything be said? Sure, always. Lewis is nothing more than the vessel that rid Ernie Grunfeld of Gilbert Arenas. This, of course, after step one of Ernie’s “evil” plan: let the world know that Arenas and Javaris Crittenton screwed around with guns in the locker room — at least this is the hypothetical paraphrasing of Arenas’ warped mind. Besides, we all know Kendrick “Bookie Ball” Long is responsible for Rashard Lewis’ presence in D.C.
Yea, remember that guy? Bookie Ball. All that aside, the narrative surrounding Lewis’ arrival in Washington was about him bringing professionalism to the Wizards locker room. If that ever had any effect on the likes of Nick Young, JaVale McGee and Andray Blatche, we’ll never know. Not sure many outside of a Kevin Garnett-type would have made a difference, if even him. But without much production to begin this past season, along with a supposed spat with assistant coach Sam Cassell and a refusal to play after seven straight losses (and before loss number eight to Minnesota), whatever professionalism and leadership Lewis could provide was rendered increasingly negligible. Just a vessel, a body, and a broken one at that. When pundits monitoring this 2012 NBA playoffs — in consideration of JaVale McGee and Nick Young — speak of the hapless Wizards franchise not possessing positive, veteran influences on those players (and how they are now ‘free’ from that), Rashard Lewis’ 14 NBA seasons and 934 career regular season games (64 playoff games) get ghosted. 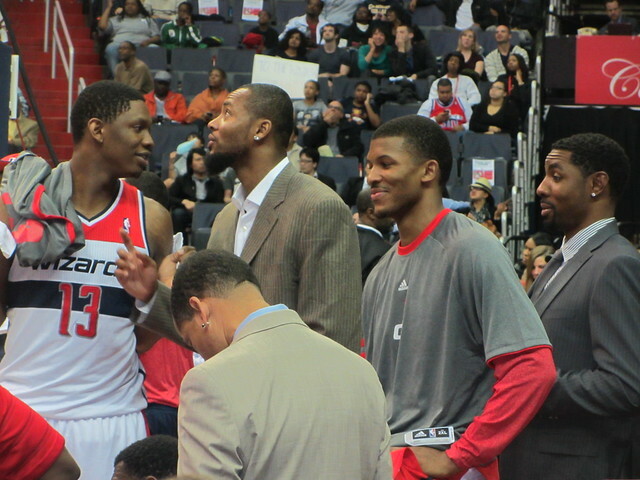 And pretty soon, Lewis’ time with the Wizards will be ghosted too. But with the minor role he played in the saga of Gilly Arenas, at least the Internets will probably never forget that he’s one of ghouls in the closet.